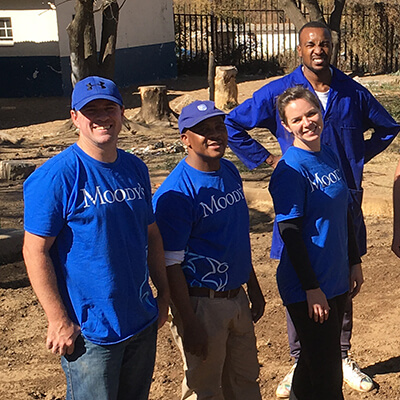 Arthur Skelskie, our Senior Vice President of Corporate Services, vividly remembers the day in 2011 when he took a group of Moody’s employees to volunteer at the Cooke School (now Cooke Academy) in New York City, which serves children with special needs in grades K–12. Arthur’s group was teaching personal finance skills to the kids to help them live more independent lives. Soon after, Arthur became a Cooke Academy board member, and over the years, he has used his background in real estate to help the program in countless ways. For example, Cooke administrators worried that their state-of-the-art curriculum wasn’t supported by state-of-the-art facilities. The children were expected to learn in hundred-year-old buildings with inefficient heating and air conditioning. Administrators asked for Arthur’s help to change that. Since 2016, he has been working with Cooke to build and outfit a new learning space.